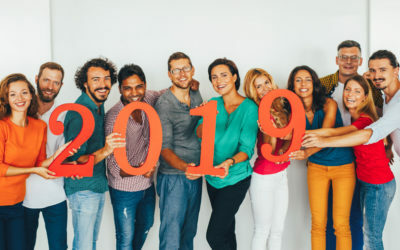 In today's webinar, SmartZip's National Sales Director Jonathan McGowan offered examples of companies who are using big data to draw in more sales and create a loyal fanbase. He also shared how SmartZip similarly analyzes big data to score and rank the homeowners most likely to sell in a given area. 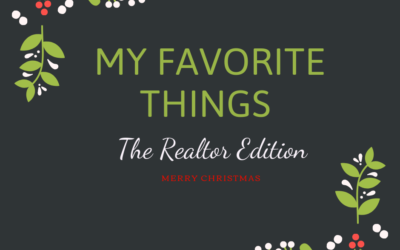 Plus, real estate and social media guru Katie Lance of Katie Lance Consulting offered great examples of how real estate agents can use free social media tools to spot selling signals. Big box retailer Target has worked to perfect algorithms that predict different life stages like pregnancy and engagement. By tracking customer purchases, Target is able to retarget their customers with applicable coupons and offers. In fact, Target's predictive models worked a little too well in one case. By recognizing that women who buy things like calcium magnesium and unscented lotions were likely pregnant, Target correctly predicted the pregnancy of a teenage girl. Unsurprisingly, this drew the ire of the girl's father (until he realized they were correct). Recognizing that this level of accuracy might be viewed as "creepy" by their customers, Target now bundles targeted deals with other offerings to appear more random. Amazon also expertly uses data to create a better customer experience and to drive up purchases. By recommending items like a lens cover or camera case when you add a camera lens to your cart, they increase your likelihood of purchasing additional items. Plus, the convenience of not having to search for new items gives you that warm fuzzy "Amazon knows best" feeling that keeps you coming back for more. Target doesn't advertise to every woman to find the ones who are pregnant. Amazon wouldn't be the online retail giant they are if they didn't make smart recommendations. How can you, a real estate agent or brokerage, use data to drum up business and build a loyal following? At SmartZip, we score and rank homes likely to sell by focusing on the relevant selling triggers for an area or neighborhood. With our flagship product, SmartTargeting, you can map a custom territory to find the local neighborhood with the highest turnover and commission potential. With a score for each homeowner in your exclusive territory, you can focus your marketing efforts on the top 20% of homes in your farm, instead of all of them. For more information on your listing potential, check your territory here. Focusing on big data scoring and ranking lets agents work smarter (they already work hard enough). But as Katie Lance mentioned in today's webinar, it's possible to find seller signals/triggers using free social media tools as well. LinkedIn has a fairly new way to engage called LinkedIn Contacts. This tool syncs with your calendar and sends followup reminders, asking if you'd like to connect with those you've just been in meetings or conference calls with. 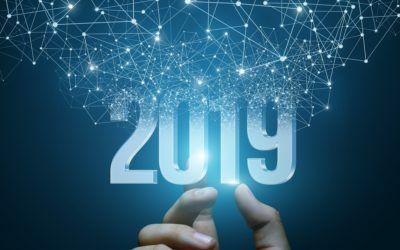 It will also alert you to social signals like job changes and promotions so you can reach out when an opportunity arises that may lead to a real estate transaction. 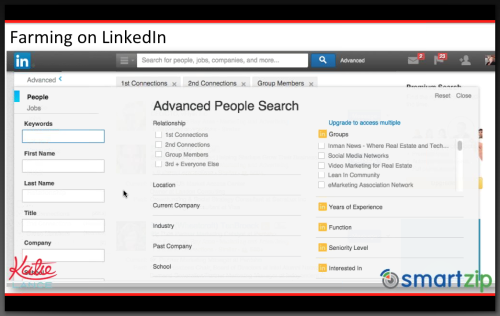 You can also run an Advanced People Search, which allows you to search for contacts (or friends-of-friends connections) who live in your area or work for a certain company. 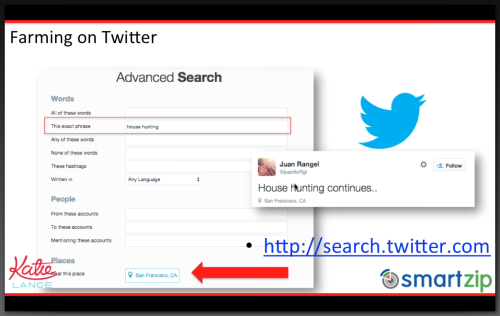 Next, head to Twitter's Advanced Search to look for real-time keywords and phrases in your market area. For example, if you searched "house hunting" in your local area of "San Francisco," you can find the people who are actively looking at homes in the area. How do you respond? Twitter etiquette allows you to connect with people you don't know, so it's fine to reach out. However, do not go for the hard sell. A friendly, knowledgeable response might read, "That's so exciting! Good luck with your search, let me know if I can help." Be sure that your Twitter bio clearly mentions that you are a local agent, and offers a link to your website so the original poster can read about your expertise and reach out if interested. The best part of this approach is that you can do it for five minutes each week, or more if you find it brings you success. Remember, Twitter moves fast so even if you are not finding a response, come back next week for new potential leads. It's a free tool that takes almost no time, so there's no excuse to give up on it! You may be sick of hearing about Facebook, but Katie Lance has some truly creative ways to make this leading social network go to work for you. 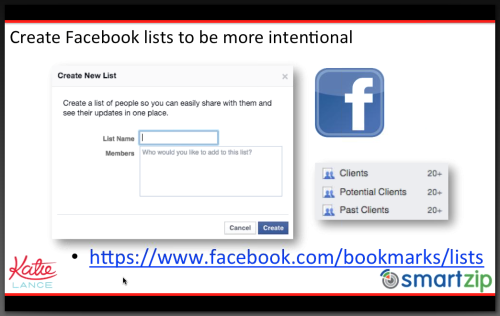 First, try creating Facebook lists of your current clients, past clients and potential clients. Then, rather than being sucked into the vortex of kitten quizzes and long distance relatives, you can easily view the people who are mostly likely to bring you business. Every time you log in to Facebook, check your lists to make sure you aren't missing any big events, birthdays or opportunities to reach out. Congratulate contacts on their new jobs, new car or new grandchild. Plus, try to elevate your community member by sharing a post that is particularly meaningful to them. For example, if the adult daughter of a past client just started a non-profit, share her link to your entire sphere to show she is supported. As Katie says, it only takes a few minutes to surprise and delight someone. If that non-profit founder ends up searching for a home in your area, she'll likely think of the kind agent who supported her cause in its infancy. Want to watch the full webinar? Catch it here in its entirety.